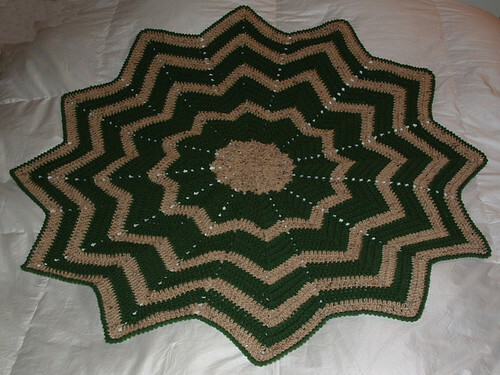 I crocheted it to 42 inches wide and decided to finish this project off as a lapghan for my local nursing home. My pattern is 6 rounds for the center in the tan, then 5 rounds in green with 2 rounds of tan between the rounds of green after that. I reduced each round of green so it started as 5 rounds of green, two rounds of tan; 4 rounds of green, two rounds of tan; 3 rounds of green, two rounds of tan, two rounds of green, two rounds of tan; and the final round in green using the reverse single crochet stitch. I crocheted the edging using the reverse single crochet or crab stitch. I hadn’t used this stitch before and was extremely pleased how the edging turned out. The reverse single crocheting gives the lapghan a nice corded finish. 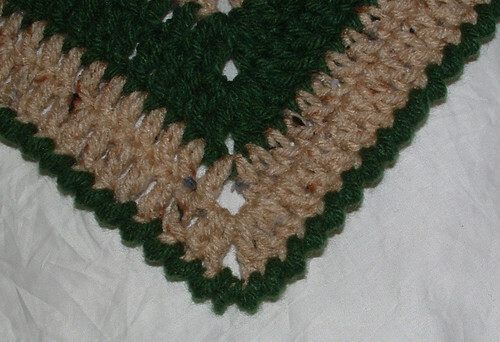 Here is a close up of the reverse single crochet edging on the round ripple. I just worked one stitch evenly around and two stitches in each point so it laid down flat. Never done reverse single crochet before? Here is a great reverse single crochet video that I found very useful. Here is a more information on how to reclaim yarn from old sweaters. This lapghan was delivered today to my local nursing home. I’m hoping someone is enjoying it tonight as much as I did while crocheting it for them. Thanks for the link to the video. I’ve never understood that stitch till I saw this. This looks great- must remember to keep an eye out for recyclable yarn. Must also remember that I already have a sizeable stash. Rolls eyes.